Picture yourself downtown — no place to sleep, no place to eat. Now imagine a place where you could get a hot meal, eight times a week at no cost. Located in downtown Canton, Refuge of Hope provides meals for the hungry and offers shelter to homeless men. With their guest numbers growing daily, Refuge of Hope considers any gift or donation to be a blessing. Needing the continued support of donors and volunteers, Refuge of Hope decided it was time to develop a new literature piece. We sat down with Jo Ann and Kristie from Refuge and took a look at the parameters. They knew they wanted a piece aimed at new donors and volunteers. They knew it needed to fit in a standard envelope in order to mail better than their current brochure. We knew we wanted to do the piece pro bono in order to put all available budget to print costs. Cassel Bear previously worked with Refuge of Hope on their capital campaign. Through generous pledges from the community, Refuge raised more than 4 million dollars to open a new facility in 2019 which will triple its capacity. Follow Refuge of Hope on Facebook as construction begins! 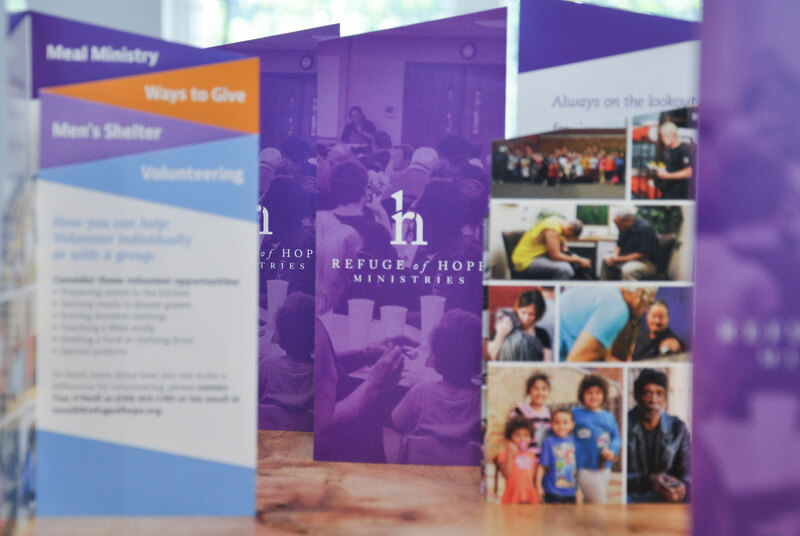 We wanted to deliver a really stand-out piece that conveyed not only Refuge of Hope’s mission, but also their personality and brand, without sacrificing any of the content from the original brochure. Matt proposed a diagonal die line across the brochure top. When folded, this simple design element would create a dynamic and stunning fold effect without breaking the bank during production. With assets provided during the capital campaign, Matt kept the color palette on-brand and vibrant. The last pieces of the puzzle were photos of grateful individuals served by Refuge of Hope — no stock photography allowed. I love working with Refuge of Hope because they’re always willing to think a little outside of the box. We took what could have been a humdrum brochure and gave it a unique twist. The final piece landed at Cassel Bear this week. It’s our hope this brochure inspires others to give their time and donations to this remarkable local ministry. Want to get involved? You can take a tour and see first-hand how Refuge of Hope nourishes our community. Click below to learn more. Learn more and get involved with Refuge of Hope.